Kevin Spacey has defended the way he runs London's Old Vic, despite an early closure for its current production and a five-month gap until its next play. The Oscar-winning actor admitted Resurrection Blues, directed by Robert Altman, began poorly and "didn't go down as well as any of us had hoped". He said it was "not unusual for a show to come off early". He told BBC Radio 4's Today programme that it was "not a disaster" the theatre would now lie empty all summer. The Southwark-based Old Vic is one of the capital's oldest theatres, having opened in 1818. 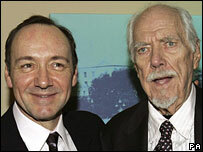 Spacey started running the Old Vic in 2003 and has a 10-year contract with the London theatre. "We never announced a production for the summer slot and therefore we haven't cancelled anything - we just haven't scheduled anything," he said. "We took a view that if we couldn't find the right production that we felt was financially right to produce, it was in our interest to put all of our resources and all of our efforts into the work that we're about to announce at the beginning of May," he said, referring to the Old Vic's next run of plays. "It's not ideal," he said, "but at the same time we're trying to get a financially responsible position." 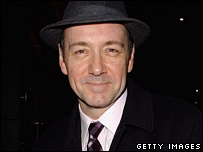 Spacey said the first time he saw the production of Resurrection Blues, he "knew it was in trouble", resulting in several weeks of intensive work before it opened. "The unfortunate thing that happened on opening night is that the actors got hit with a case of the nerves and it kind of fell apart on that evening, and I think the reviews reflected that. "Everyone was completely open and honest about the fact the show wasn't where it should have gotten, but I can tell you that after the critics' night, that cast pulled themselves together. "They started to deliver that play in a way that I think audiences saw a much better production than those critics saw." He denied press reports that actress Jane Adams - who played Emily - had stormed out of the play. "That's not true. There were artistic differences and there was a mutual decision that she should leave the production." Spacey added he was "more determined than ever" to complete his 10-year contract. "This the middle of our second season, it's very early going, nothing has put me off from our goal and our plan." He had no reason to say sorry, he said, because "I don't think that 18 months in, that anyone needs to apologise for having done a programme that's brought 425,000 people into the theatre". "That's nearly more than two times the number of people that came into the Old Vic in the previous two seasons," he said. "We must be doing something right even though 11 or 12 people who write for newspapers don't particularly like what we've done." Spacey, who has won Oscars for The Usual Suspects and American Beauty, has said fell in love with the Old Vic after being taken there during a childhood holiday. He appeared on the Old Vic stage in 1998, and was heavily involved in fund-raising and running the theatre since becoming a trustee that year. The actor has invested more than £100,000 of his own money into the venue.